I am a complete RC noob and I want to know how much it will cost to build the swappables from the SBK, assuming I have nothing RC related. I have no radio, no battery charger, nothing. How much would it cost to build all of the planes? (The FT flyer, FT delta and FT nutball) I want the cost of EVERYTHING. $120 to $200 depending on how nice a radio you want. With the odds and ends, expect to spend about $150. Here's what I would do. Buy the swappable series from Lazertoyz.com. You will still be supporting Flite Test with your purchase. They also have an option to include enough servos for all three planes. Total is $98.99 plus shipping. The only other thing you'll need is a radio and receiver. 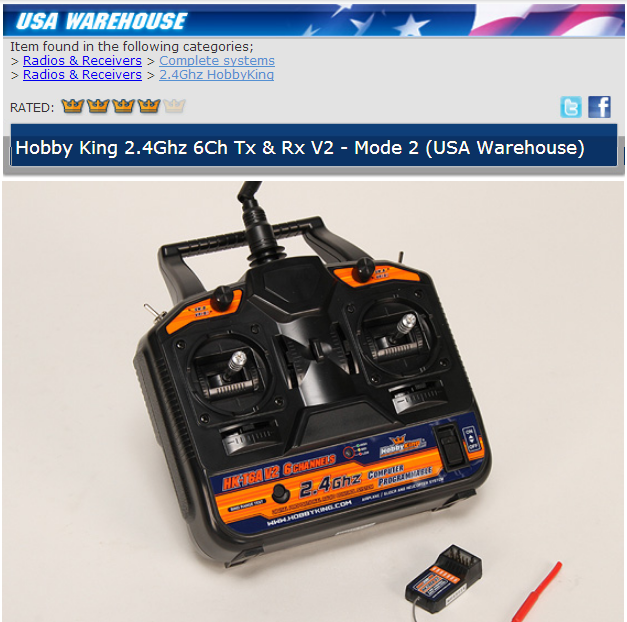 This one from the Hobby King US warehouse is only $29.99 for a 6 channel 2.4 GHz transmitter and a receiver. Expect about $6.00 shipping. And of course you'll need tape, razor blades, pliers, etc. to finish the build. That should end up being a total of $150 or less. The best part is you won't have to wait for 4 weeks for stuff to arrive from Hong Kong. You could save a little by buying sheets of Dollar Tree foam board and cut everything out yourself as I did, but the Speed Build Kits with their very precise laser cuts will save a lot of time and frustration (I could never quite get a perfectly vertical cut). I wish I had started with the SBKs. Your info really helped, but wouldn't I have to buy a charger as well? Those would probably bring the cost up to like $200+! Also, would it be possible to use the OrangeRx T-SIX? I just put a swappable set up together for my dad, who had nothing, and it was $143 shipped. This included TX, RX, 2 batteries, charger, 5 servos and loads of extra props. On the other hand, I already had a TX, charger, lipos and put my swappables together for ~$30. That's awesome, which electronics did you use? Your info really helped, but wouldn't I have to buy a charger as well? I realized that I had forgotten the charger shortly after I posted. I would recommend the Turnigy Accucel6 from HobbyKing. It is about $24 and will charge up to a 6s battery pack. I also have a Hobby King Variable S for around $18. They are nearly identical except for the external form. The Accucel6 has the balance ports built into the charger, where the Variable S has an external cable for balancing. Also, would it be possible to use the OrangeRx T-SIX? Absolutely. I was simply going for inexpensive and items with which I had personal experience. I hear good things about the OrangeRX. But the OrangeRX is more than twice the cost of the HK-T6A. I have the 'Just Another Charger' from Hobbyking. its got everything, even comes with the ability to charge from your power point. so you can charge at home if you want.